At NDES, we believe there’s a lot more to education than just academics. Students need the opportunity to apply their skills with extracurricular, hands-on activities like clubs and sports. We offer our students many options for getting involved outside the classroom. North Decatur's archery club is a certified National Archery in Schools Program (NASP) that is offered to students in 4th through 12th grade of all genders, physical abilities, and backgrounds. NASP is designed to teach International style target archery that focuses on safety technique, mental concentration, and self-improvement. NASP is currently in more than 13,000 schools in 47 States as well as other countries. North Decatur currently has three teams that include an elementary, middle school, and high school team. Our teams travel and participate in over a dozen tournaments in a season including home tournaments, State, National, and World tournaments. Our teams and archers have won several Awards including State and National awards. Archery is a sport recognized by many colleges where our archers can earn scholarships as well as earn scholarships at State and National tournaments. Archery is a lifelong sport that nearly everyone can succeed at. Archery has proven to help many students excel in many different aspects. 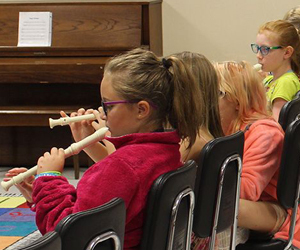 5th and 6th graders may choose to take band in place of their specials a few days a week. The students go to the high school to have class with the high school band director during their designated specials time. 5th and 6th grade boys basketball is an intramural sport. The boys play games against each other and also play South Decatur two times a year. The boys learn the basics of the game and develop a love for the sport. 5th and 6th grade girls basketball is an intramural sport. The girls play games against each other and also play South Decatur two times a year. The girls learn the basics of the game and develop a love for the sport. The Greensburg/Decatur County Public Library sponsors the Battle of the Books program, which consists of a 5th and 6th grade team. Participants accept the challenge to read 10 pre-selected books within a few months. The purpose of this fun program is to introduce young adult readers to a variety of fiction books and encourage them to include reading as leisure time activity. The competition is on a Saturday during the month of April at the public library, where the 5th and 6th grade teams get the opportunity to battle against other schools in the county. During each round of competition, the teams answer prepared questions designed to show the readers’ knowledge of the plot and characters from the books on the reading list. Team members collaborate on their answers. The first place team walks away with a trophy for their school. Team tryouts begin in January. Be sure to check out this unique and fun opportunity! The Big Brothers Big Sisters High Five Program matches Elementary Students, who will benefit from a positive friendship, with a High School Mentor to achieve the Big Brothers Big Sisters goal of helping all children to achieve success. With High School Students and Elementary Students meeting for lunch one day each week, the Elementary Students receive a lunchtime friendship which provides individual attention, academic encouragement and positive re-enforcement. High School Students develop a sense of responsibility and caring for others. Elementary Students are referred by their teacher and High School Students are approved by both High School Guidance Counselors and Elementary Principals. Big Brothers Big Sisters Program Manager is on-site to supervise all High Five Meetings. By working together children facing adversity are provided with professionally supported one-to-one relationships that change their lives for the better, forever. 6th graders may choose to take choir in place of their specials a few days a week. The students go to the high school to have class with the high school choir teacher during their designated specials time. Each season, girls in 3rd–5th grade develop essential skills to help them navigate who they are and what's important to them, the value of teamwork and healthy relationships, and how they can have a positive impact on the world. Girls also make a meaningful contribution to their community through a team-organized Community Impact Project. Physical activity is woven into the program to inspire an appreciation for fitness and healthy habits and teach life skills including treating others with care, practicing gratitude, and managing emotions. Each season culminates with a Girls on the Run 5K event. This celebratory, non-competitive event provides girls with a sense of accomplishment and instills the value of goal setting at a young age. Girl Scouts: When you unleash your inner G.I.R.L., you can accomplish anything! At Girl Scouts, the next opportunity to stand up, speak up, and take the lead is never far away. With us, you’ll discover the G.I.R.L. (Go-getter, Innovator, Risk-Taker, Leader)™ in you! Will you find a sustainable solution to a problem in your community? Will you explore the great outdoors? Build a robot? Learn to code? Conduct an experiment? With us, the possibilities are truly endless. Discover all you can be and everything you can accomplish when you have the right tools and a safe space to shine—and work together to change the world. So what are you waiting for? Troop options are available right here in North Decatur. Contact: Ashley Schwering,CTO, 812.593.0025 or Melanie Maxwell, Recruitment Manager at 317.924.6890 or mmaxwell@girlscoutsindiana.org. Boy Scouts: Most important of all Cub Scouts have fun, make friends, and learn how to get along with others, and Pack 574 at North Decatur Elementary is doing just that. Scouting is proven to increase participant’s self-esteem, willingness to help others, give them the ability to make good decisions and solve problems. Cub Scouts learn these valuable lessons at weekly meetings, campouts, science events, and parent weekends at camp, all with their friends and families having a great time. Join Cub Scouts Pack 574 and ignite the fire inside of you. For more information contact Amanda Caudill at caudills@tds.net. The iChargers Student Tech Team consists of at least one student from each classroom in grades 3-6. They learn troubleshooting skills and advanced tech skills so that they can assist students and teachers in the classroom. They also help with special school events such as Digital Citizenship Week and Hour of Code, and often complete special projects for the school involving technology. Math Bowl is an exciting team competition which pushes students to excel with complex, multi-step mathematics problems. Students spend many hours practicing solving these problems to prepare for the area contest at the end of February. Each year, the competition focuses on specific standards. This event is made up of four rounds, each round consisting of eight questions. Our squad is made up of 4th, 5th, and 6th grade students who work in teams of 3-4 people. The school answering the most questions correctly at the area meet wins the competition! The Recycling Green Team is an interactive educational 5th and 6th grade program that empowers students and teachers to help the environment through waste reduction and recycling. The team ensures each classroom and office receives a marked recycling container and encourages each class to participate. Routes are planned and developed by the team as they are responsible each week for collecting, loading,and transporting recyclables throughout the school community. We have 100% classroom participation in this program! Spell Bowl is a statewide spelling competition sponsored by the Indiana Association of School Principals. It is a state academic competition for 4th, 5th and 6th grade students. Up to 16 students can be on the team, and the top 8 scorers compete in our final competition. The kids study a list of 750 words, and are randomly given 7 words to write at competition. They compete with other schools of like size in the state. Tryouts are held in August, and practice starts immediately following until competition in November. Spell Bowl competitions begin with an invitational at Milroy Elementary then we try to have at least one mock competition. In November there is the Decatur County Kiwanis Spell Bowl and our final competition. Students in grades 4, 5 and 6 are invited to try out by taking a 20 word test over words taken from the official Spell Bowl list of 750 words. The word list is made available in May and it is also offered again at the beginning of school. The competition is a regional meet with scores then being sent to the state level to determine placement overall. Team members learn new words, accept new challenges, expand their vocabularies, and make new friends. The 6th-grade Rocket Club is an activity that our students do to enhance our science curriculum. The students buy and then build a rocket of their choice. Then, just like NASA, all of the 6th-grade students form Launch Support teams to launch and recover the rockets. The Rocket Club’s final activity is Super Launch Saturday in May, when parents can watch their child’s rocket fly into the sky. The club has been active at North Decatur for over 30 years. Girls are given the opportunity to learn the basic skills of volleyball while working on team building skills. The girls will also participate in a tournament at the end of the camp. We will add practice and game schedules as they become available for each sport. All student athletes must have a current physical form on file with the school nurse in order to participate. Physical forms are available in the front office, here on our website, and on the IHSAA website.